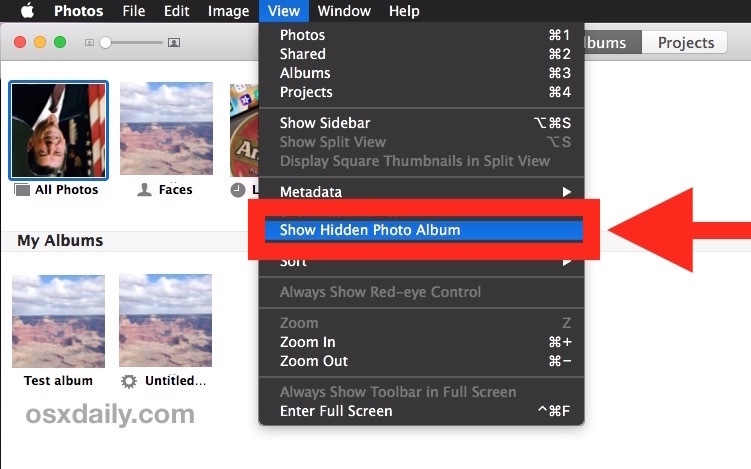 If you have some picture(s) you’d rather not shown alongside your regular photo album in Photos for Mac, you can hide those photos and then use a special Hidden Photos album to contain the hidden images and browse them separately. These hidden pictures will be self contained and separate from the regular album views, though they can still be easily accessed from the Photos app on Mac. We’ll show you how to hide photos, and then how to access the Hidden album, and how to unhide pictures as well. 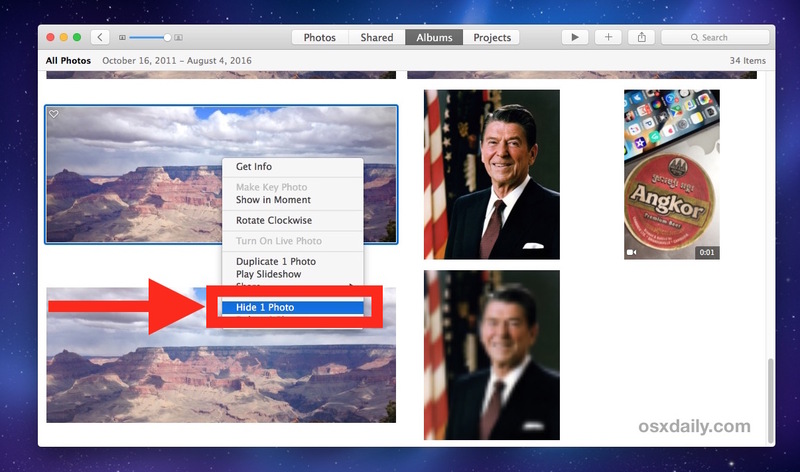 To be clear, this is only hiding a picture from plain view in the Photos for Mac app, similar to how you can hide photos from plain view on the iPhone and iPad by utilizing the Hidden album. It does not hide the picture from the Mac or search features in general, and it’s not protected by a password or anything else, it’s just a simple alternative photos album that is contained separately from the regular album. You can hide multiple images by either selecting multiple pictures concurrently with dragging the cursor, or by Command+clicking on each picture before choosing to hide the photos. 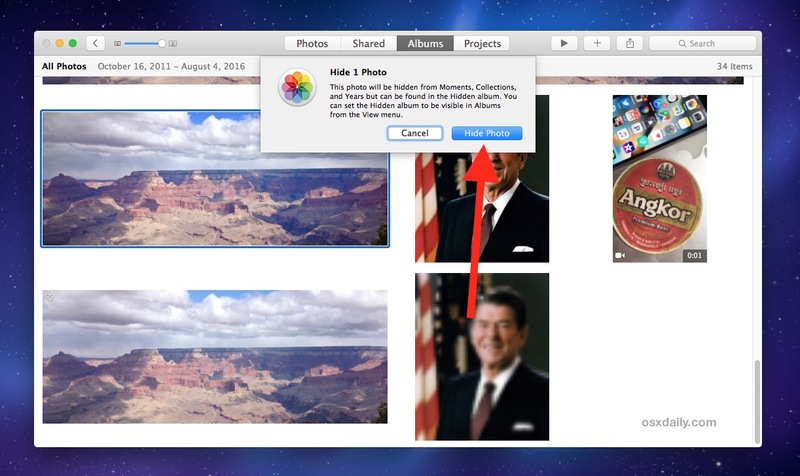 Once the picture is hidden it will no longer be visible in the general photos view of Photos app for Mac, and instead will be found only in the Hidden photos album. Pictures can be removed and unhidden as needed as well. Once a picture has been unhidden it will return to the regular view within Photos for Mac, where it started off. The Hidden album is quite useful for many obvious reasons, perhaps you’re copying pictures into Photos from an iPhone or camera and brought along a few pictures you’d like to save but don’t necessarily want shown in the obvious views of the app. On the other hand, if you have a ton of pictures you are hiding or want separate, you might want to consider simply creating a new and separate Photos Library on the Mac, and then switching between the two photo libraries as needed depending on which pictures you want to view. Apple should offer the option to password protect the hidden folder. I agree it would be nice to be able to password protect these folders like we can password protect Notes. Maybe password protect folders in general via Finder would be great without having to disk image it. Such a bad and insecure way of doing things. Come on Apple. People have been complaining about this for years. Those simple and elegant programs they made for computer idiots like myself in the ’90s and early 2000s are now as complicated (and worse) than Windows at its ugliest. Sorry…this wasn’t an answer…just venting. It took me a while to figure out that this symbol, showing paint color sticks fanned out, was supposed to have something to do with photographs. Or maybe it’s the NBC peacock sitting on a mirror. I don’t know, but if someone sees it for the first time, how would they know it has something to do with photography? Well you seem to know the NBC peacock; but if someone sees it for the first time, how would they know it has something to do with television? I am very disappointed Apple is not oferring the option to password protect the hidden folder. Anybody who opens my Photos can go to the Hidden Icon. What is even the point of having it. Pictures would be better protected hidden in thousands of other. I am totally confused. 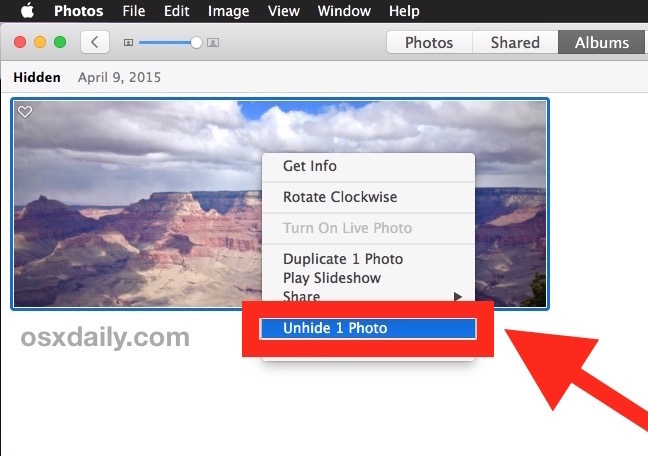 I have been hiding photos using the right click option menu, and then choosing “hide photo”. YET…when I go to the dropdown menu under “View” the line “Show Hidden Photo Album” is in pale grey and not an active link. WTF??? Where have all my photos gone and how the heck do I access them. Any advice, dear people who are savvier than I? !